While I'm a total homebody and love pretty much nothing more than laying on the couch with some chips and guac, I have to say that the idea of a New Year's Eve wedding has always given me a thrill. What better way to ring in the new year than celebrating with people you love? And for those of us who, like me, find New Year's Eve a little bit stressful (Should I host a party? What if I don't get invited to a party? Is it okay that all I want to do is go to the movies? ), being a guest at a New Year's Eve wedding is the perfect solution. Built-in dinner, dancing, and fireworks. Perfect! So needless to say, I was really pumped to be asked to do the florals for Libby and Kevin's wedding at Breezy Bend Golf Course. I could tell right away that Libby has great style, and she had a pretty clear idea of what she wanted right off the hop. When I arrived on the day of to set everything up, I couldn't believe how much I loved everything she had chosen. It was glitzy without being tacky, elegant without being stuffy, and glamorous without being over the top. In a word, it was perfect! Libby went for a classic black, white and green palette (with an emphasis on lots of green). We still wanted to bring in a lot of texture to the flowers. Bridal Bouquet Ingredients: Garden roses, lisianthus, anemones, yin and yang poms, with several varieties of ruscus, podocarpus, and English boxwood (funnily enough, Libby's only request was for English boxwood!). Obviously I had to include one of me delivering the bouquets :) With a winter wedding, this is how everything comes: wrapped up in layer after layer of plastic to keep the warm air in and the cold air out. It was stinking cold on December 31, 2017 (as it usually is on NYE) so I think I actually had 3 layers of plastic bags on these bouquets! You'll also see me below showing Libby how to hold her bouquet, which I do with every bride/bridal party. Unless your bouquets are round in shape, there will be a front side and a back side. I always tell my clients that the pins are in the backs of their bouquets, so that's where they can place their thumbs. Once they've got the right side, we talk about where to hold the bouquet so it's most flattering. I really don't want you to cover up your entire dress by holding your bouquet too high! The best position is to place your wrist bones on your hip bones, and angle the bouquet slightly out. The ceremony was held at the Manitoba Club (just like this winter wedding was), in the ballrooms. It's such an elegant and high detailed space that we didn't want to do too much in here. 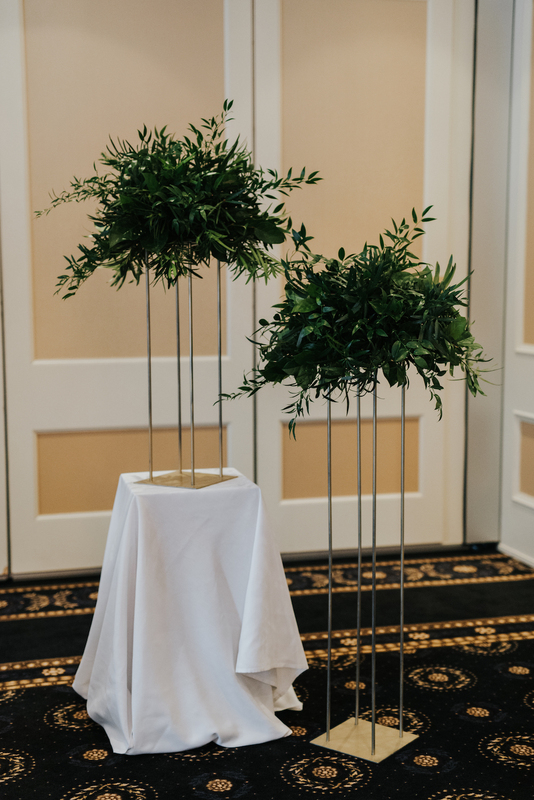 We tossed around the idea of a draped backdrop with florals along the top, but in the end, settled on a set of 4 mixed height gold, thin gold stands with textured greenery arrangements set on top. It drew the eye in to the "altar" without taking away from the space. We kept things much the same at the reception: lots of greenery, lots of white, lots of gold. I'll tell you, when I walked in and saw how good it all looked even without centrepieces, I got REALLY excited. The tables were covered in white sequins, which added just the right NYE feeling without feeling gaudy in any way, and the gold-rimmed glassware really upped the elegant factor. For the head table, Libby wanted a beautiful, low, lush arrangement that would make the small table feel really special. Keeping the focus on the greenery, I decided that the only white bloom I'd use would be white hydrangea. It's a classic, and is perfectly suited to this type of setting. 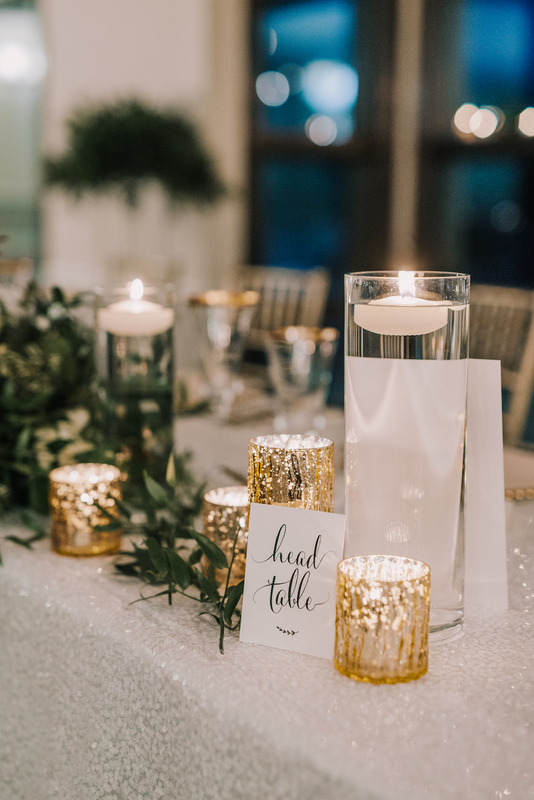 The guest tables featured a large greenery bouquet, white sequinned table linens with gold accents, and a greenery sprig on each place setting with TONS of candlelight. Planning a winter wedding in Winnipeg? Planning a winter wedding in Winnipeg? I'd love to dream up some incredible ideas for your wedding flowers and I'm now booking for winter 2018/2019! I have plenty of availability throughout November, December, January and February. 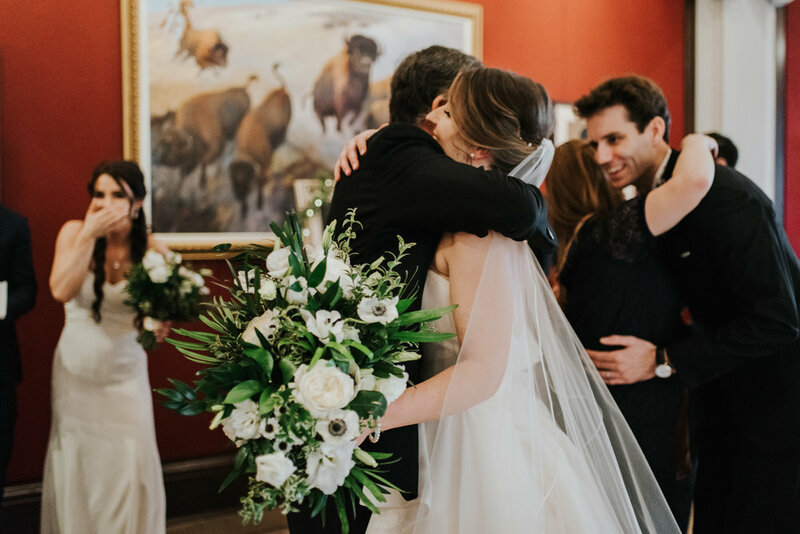 Whether you already have a specific vision or want me to dream up something custom just for you, reach out to Stone House Creative to create the perfect ambiance for your wedding! 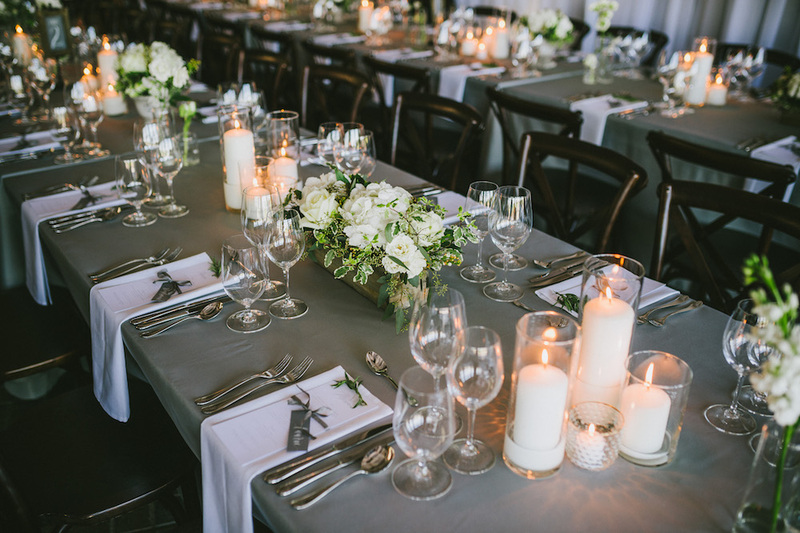 One of the most frequently requested wedding palettes I get is white and green. To be honest with you, this stresses me out a bit, because it can be very difficult to make a white and green wedding unique. I want all of my weddings to feel personalized and special, so you can see where my struggle comes in. So today, I want to show you different wants to make a white and green wedding palette unique! Blush has been a very popular accent for the past few seasons. In 2017, I'm tucking in shades of burgundy, caramel, lavender and blues to add a bit of dimension and interest. Adding in a delicate touch of colour doesn't mean that you suddenly have a colourful wedding. I'm talking about a ratio of about 10% colour accent and 90% white and green. With a touch of colour, you get a distinct effect depending on the accent shade chosen: light blue becomes whimsical, burgundy becomes luxe, caramel becomes fresh. Bringing in a lot of texture adds interest. 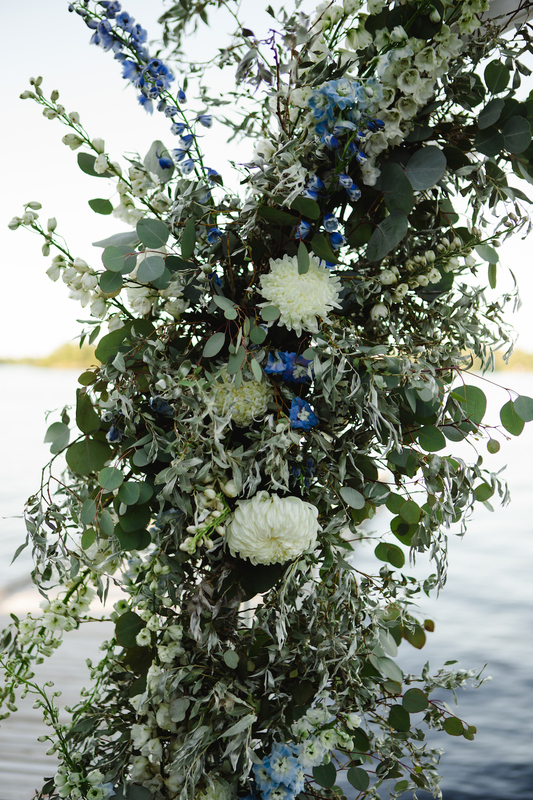 In the ceremony arrangement below, the texture is brought in through several different types of eucalyptus. Different shapes of leaves and the introduction of seeds make this feel interesting and fresh. I also love the idea of introducing natural textures - branches, pods, twigs, vines, herbs. For some wedding ceremony installations, I have gathered sticks for months ahead of time, knowing that they were going to add in a beautiful touch. 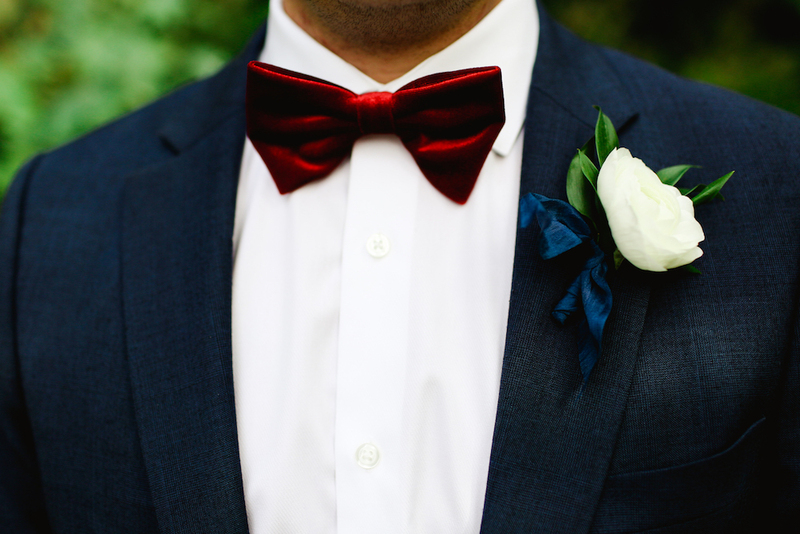 I always like to select one key foundational colour to use throughout a wedding and tie it all together. I usually prefer something that's softer and more neutral, but it doesn't have to be that way! 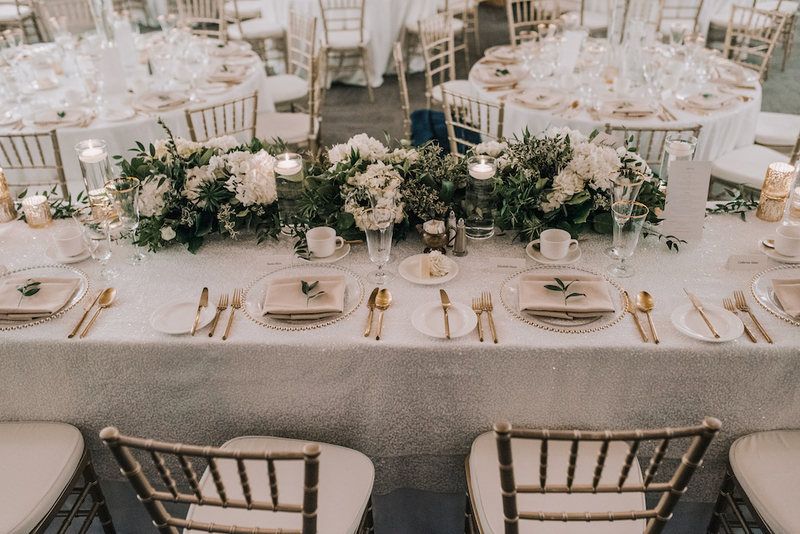 A white and green wedding palette works well with all sorts of great foundational colours, like soft grey, brown, champagne, blush, other shades of green, mocha, light blue, burgundy, lilac...really, anything! 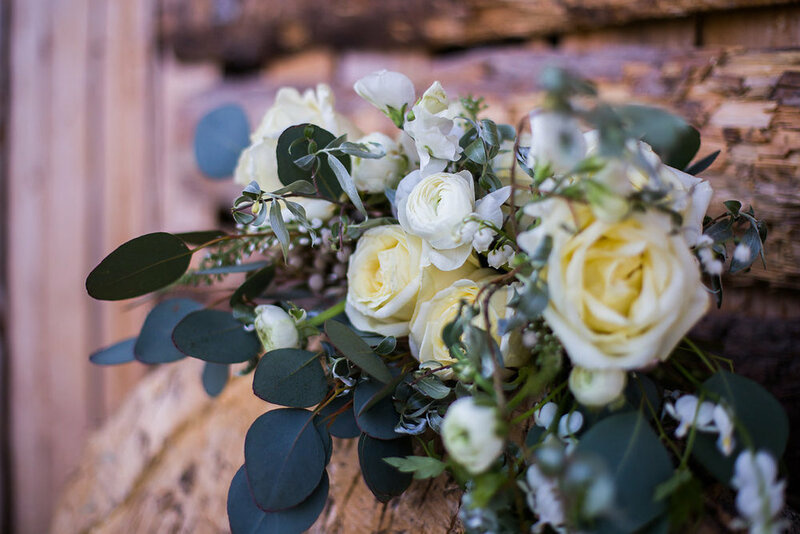 This is definitely one of the simplest ways to make your white and green bridal bouquet look differently than all the other white and green bridal bouquets. 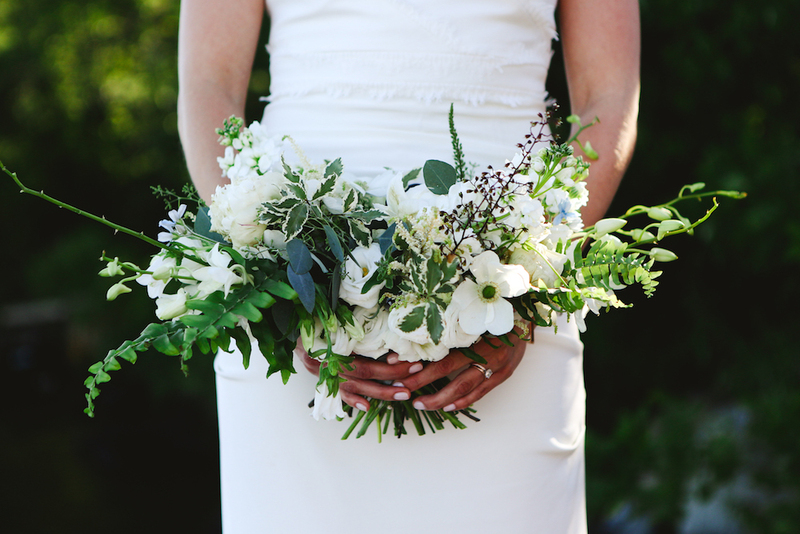 For Katie's bouquet below, I tucked in green viburnum (which is actually a flower!) and the fresh, bright green was a great choice. Or, you can go a completely different route with a different colour of foliage altogether! Magnolia is a gorgeous choice with those big, velvety, coppery leaves and copper beech foliage is also awesome. This would be amazing for a fall or winter wedding. 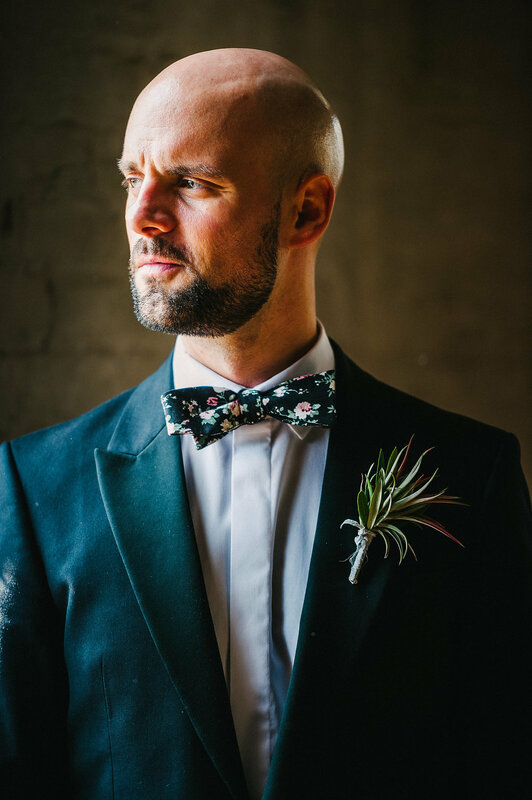 When I first met with Jessica and Andrei to talk about their wedding flowers, I simultaneously felt like I wasn't cool enough to be a part of their wedding and also knew that I had to become cool enough to be a part of their wedding. 'Cause when a city planner and an interior designer get married, you know it's going to be pretty slick. And if this one picture doesn't prove it to you, allow me to continue. This couple has a modern aesthetic, the coolest house in Wolseley, and just check out Jessica's Houghton NYC gown. Jessica's bridal bouquet was really fun to create, and it was SO light and easy to carry. I used three different types of eucalyptus, olive foliage, air plants, white protea, and a few stems of large-headed white roses. 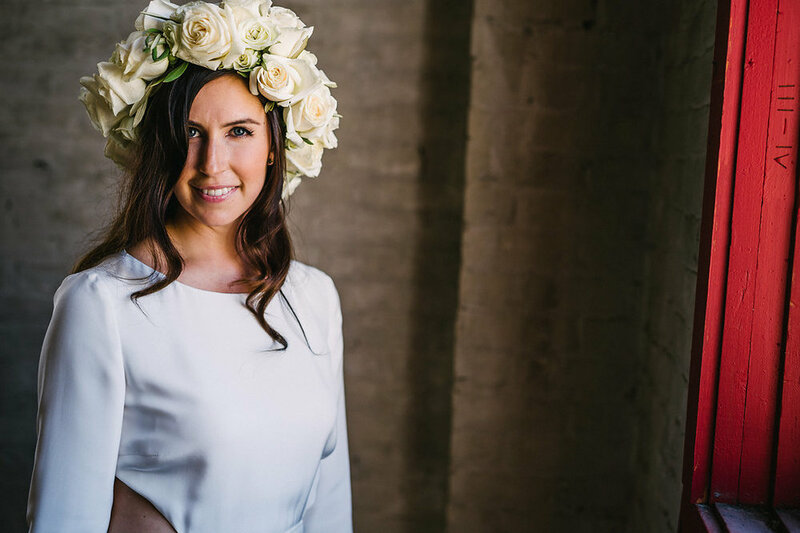 I also created a large, full white rose floral crown for her. For the bridesmaids, we did up bouquets of just greenery, and also loose blooms for their hair. This was probably the best-dressed group of bridesmaids I have ever seen. The couple crafted this incredibly cool, geometric arch for their rooftop ceremony at the Winnipeg Art Gallery. They also made mini cement planters for potted succulents, and I provided them with monstera leaves and white protea for their centrepieces. Stephanie and Corey's wedding literally couldn't have been more amazing. The florals were garden-inspired, the bride has unreal style, and the reception was set at a private mansion. Say what?! Yep. Straight up fantasy-turned-real-life. 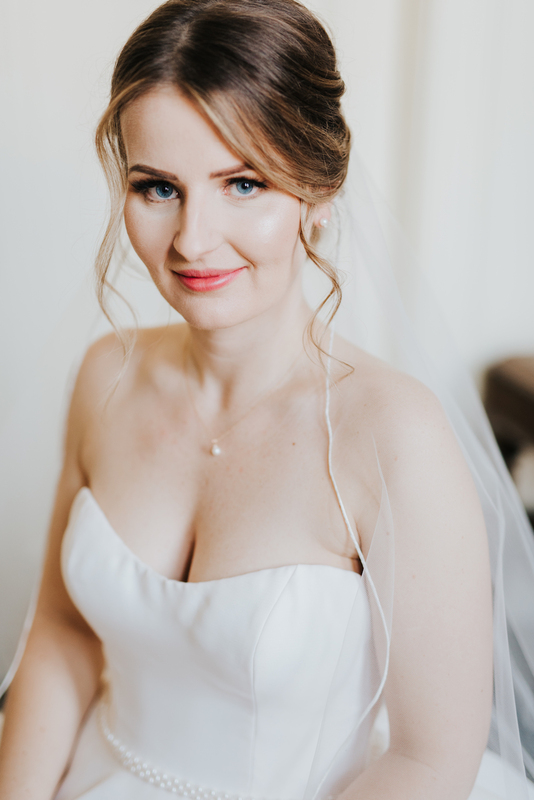 Take a look at these incredible photos from Luckygirl Photography to see some of their day! 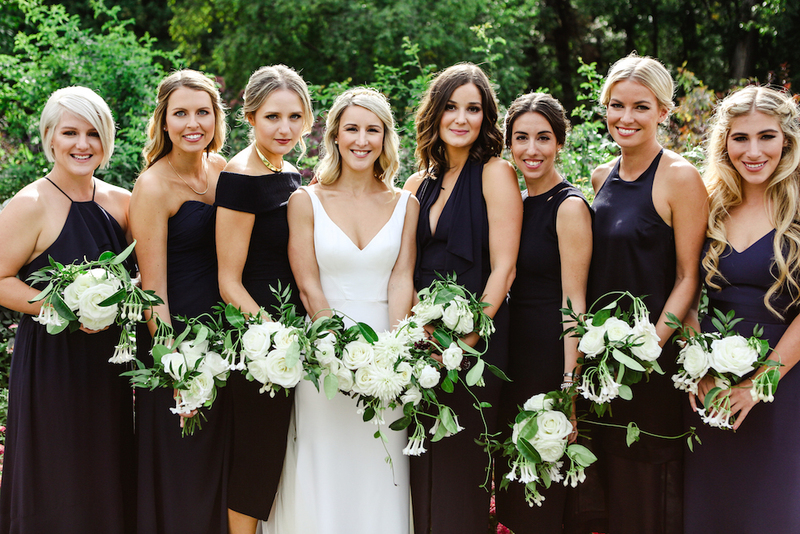 These bridesmaids are so chic! All in elegant navy gowns, and so not the typical "bridesmaid" dresses. I created petite posey style bouquets for them, using a small handful of white garden roses and the most amazing white stephanotis vine. Each of these bouquets only has one stem of vine in them! They were so heavy with blooms that I just wrapped the vine in and out of the bouquets. It added such a sweet scent! I really loved Stephanie's bridal bouquet! All white and green, with a few hits of deep plum with some locally grown scabiosa touches. Her bouquet had all the best blooms: white roses, white garden roses, white dahlias, white ranunculus, and that gorgeous stephanotis vine! I can't even get over this incredible space! This is a private mansion in Winnipeg, featuring its own ballroom. It was initially built as a wedding gift by the bride's parents - isn't that amazing? Someone can build me a mansion any day now. I won't complain. Behind Corey, in the picture above, you can sort of see the greenery installation I created on the fireplace. Designing this piece was one of the happiest moments of my entire summer wedding season. It was so much fun to do something different than the usual! Jackie and Nate were married the last weekend of May, and I absolutely loved making her bouquet. It was all white and green, with a botanical, natural-inspired shape. We used large headed white roses, ranunculus, sweet pea, and silver brunia and I also included bleeding heart and lily of the valley from my garden. I can't tell you how much I loved including flowers I grew myself! These photos are from the wonderful Hailey Funk Photography. Jackie was also the SWEETEST bride. She was totally open to me doing my thing, and on the day of the wedding, she was just the happiest bride I've seen. She was just laid-back and walking on air. It was such a wonderful wedding to be a part of! More from Jackie and Nate's wedding is coming up on the blog next week!